Poker professional Allen Kessler is well known for grinding all sorts of games. 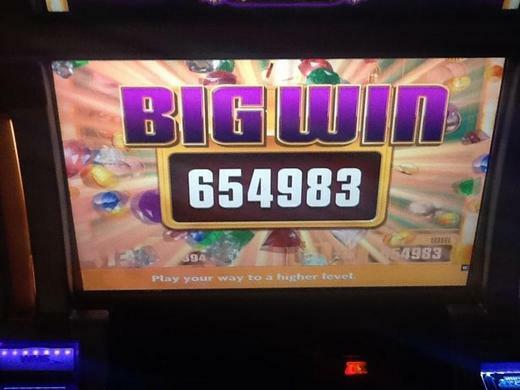 In one spin on Friday evening, he hit a penny slot for his all-time best of $6,549.83. That’s 654,983 pennies. He said he invested 200 pennies, which is the maximum bet. Kessler, perhaps known better by his nickname “Chainsaw,” has about $2.5 million in live tournament earnings spanning a lengthy career playing some of the biggest buy-in poker tournaments around. “I enjoy penny slots that have exciting bonus rounds,” said Kessler, who a couple of years ago admitted that he thinks his competitors see him as the tightest player in poker. When asked why he plays penny slots considering his lifetime poker earnings, Kessler reiterated that penny slots provide “exciting action” and that video poker, his other casino favorite, has become “kind of boring” after playing it for 20 years. While Kessler’s hit was sizable, the record for a penny slot appears to be about $3 million, hit more than once — most recently earlier this year in Nevada, the Las Vegas Sun reported. Photo via Kessler’s Twitter account. ZERO: The amount I, or anyone else reading this actually give. This is pathetic. False. However, I can appreciate your comment. I can not, however, appreciate this being an actual story on a good poker news site. Respectfully disagree...I chalk it up to a story on the lighter side of things. I'm a 1-2 NL grinder who enjoys playing 25-cent/hand vidpoker every so often as a means of de-stressing...stabbing a progressive for a couple grand playing those stakes would be pretty cool, and were I a celeb like Allen Kessler I wouldn't be waking up my publicist at 3am to promptly put out a press release about it but I'd still think it's pretty freakin' cool and gladly make time for a reporter who felt like filing a story on the score. BTW, I, too, enjoy penny (and even nickel) slots that have exciting bonus rounds. Slingo Bonus Deluxe and the Hot Shot Progressives are two of my regulars.